For other uses, see Rat Pack (disambiguation). The Rat Pack was a supergroup of actors originally centered on their leader, Humphrey Bogart, until his death in 1957. By the 1960s, it was the name used by the press and the general public to refer to a later variation of the group that called itself "the Summit" or "the Clan," featuring Frank Sinatra, Dean Martin, Sammy Davis, Jr., Peter Lawford and Joey Bishop; they appeared together on stage and in films in the early 1960s, including the movies Ocean's 11, Sergeants 3, and Robin and the 7 Hoods (in the last film, Bing Crosby replaced Lawford). Sinatra, Martin, and Davis were regarded as the group's lead members. The name "The Rat Pack" was first used to refer to a group of friends in New York. Several explanations have been offered for the famous name over the years. 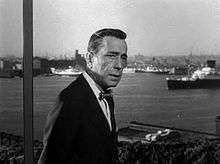 According to one version, the group's original "Den Mother", Lauren Bacall, after seeing her husband (Bogart) and his friends return from a night in Las Vegas, said words to the effect of "You look like a goddamn rat pack." "Rat Pack" may also be a shortened version of "Holmby Hills Rat Pack", a reference to the home of Bogart and Bacall which served as a regular hangout. Visiting members included Errol Flynn, Nat King Cole, Mickey Rooney, Jerry Lewis and Cesar Romero. According to Stephen Bogart, the original members of the Holmby Hills Rat Pack were: Frank Sinatra (pack master), Judy Garland (first vice-president), Bacall (den mother), Sid Luft (cage master), Bogart (rat in charge of public relations), Swifty Lazar (recording secretary and treasurer), Nathaniel Benchley (historian), David Niven, Katharine Hepburn, Spencer Tracy, George Cukor, Cary Grant, Rex Harrison, and Jimmy Van Heusen. 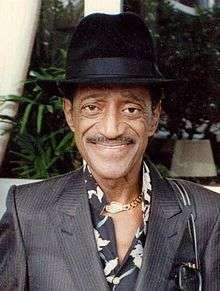 In his autobiography The Moon's a Balloon, David Niven confirms that the Rat Pack originally included him but neither Sammy Davis, Jr. nor Dean Martin. The 1960s' version of the group included Frank Sinatra, Sal Mineo, Dean Martin, Sammy Davis, Jr., Peter Lawford, and Joey Bishop. Marilyn Monroe, Angie Dickinson, Juliet Prowse, Buddy Greco, and Shirley MacLaine were often referred to as the "Rat Pack Mascots". Comedian Corbett Monica also worked as the frequent opening act for Frank Sinatra - later including Dean Martin and Sammy Davis Jr. - and played Larry Corbett, manager and friend, to Joey Bishop’s character on “The Joey Bishop show” from 1963-1965. The post-Bogart version of the group (Bogart died in 1957) was reportedly never called that name by any of its members – they called it the Summit or the Clan. "The Rat Pack" was a term used by journalists and outsiders, although it remains the lasting name for the group. Often, when one of the members was scheduled to give a performance, the rest of the Pack would show up for an impromptu show, causing much excitement among audiences, resulting in return visits. 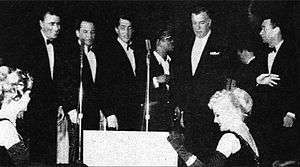 They sold out almost all of their appearances, and people would come pouring into Las Vegas, sometimes sleeping in cars and hotel lobbies when they could not find rooms, just to be part of the Rat Pack entertainment experience. The Rat Pack's appearances were of unprecedented value because the city would always become flooded with high rollers, wealthy gamblers who would routinely leave substantial fortunes in the casinos' coffers. The marquees of the hotels at which they were performing as individuals would read, for example, "DEAN MARTIN - MAYBE FRANK - MAYBE SAMMY" as seen on a Sands Hotel sign. Peter Lawford was a brother-in-law of President John F. Kennedy (dubbed "Brother-in-Lawford" by Sinatra), and Kennedy spent time with Sinatra and the others when he visited Las Vegas, during which members sometimes referred to the group as "the Jack Pack". Rat Pack members played a role in campaigning for Kennedy and the Democrats, appearing at the July 11, 1960 Democratic National Convention in Los Angeles. Lawford had asked Sinatra if he would have Kennedy as a guest at his Palm Springs house in March 1962, and Sinatra went to great lengths (including the construction of a helipad) to accommodate the President. When Attorney General Robert F. Kennedy advised his brother to sever his ties to Sinatra because of the entertainer's association with Mafia figures such as Sam Giancana, the stay was cancelled. Kennedy instead chose to stay at rival Bing Crosby's estate, which further infuriated Sinatra. Lawford was blamed for this, and Sinatra "never again had a good word for (him)" from that point onwards. Lawford's role in the upcoming 4 for Texas was written out, and his part in Robin and the 7 Hoods was given to Bing Crosby. On June 20, 1965, Sinatra, Martin, and Davis, with Johnny Carson as the emcee (substituting for Bishop, who was out with a bad back), performed their only televised concert together during the heyday of the Pack at the Kiel Opera House in St. Louis, a closed-circuit broadcast done as a fundraiser for Dismas House (the first halfway house for ex-convicts) and fed live to movie theatres across the country. Thirty years later Paul Brownstein tracked down a print of the "lost" show in a St. Louis closet after someone noticed mysterious cameras onstage during a CBS documentary on Sinatra which filmed part of the show. It has since been broadcast on Nick at Nite (in 1998) as part of The Museum of Television & Radio Showcase series and released on DVD as part of the Ultimate Rat Pack Collection: Live & Swingin. In 1981, Dean Martin and Sammy Davis, Jr., appeared together in the film Cannonball Run, and were joined by Sinatra in the sequel Cannonball Run II. This would be the last time that the three would appear in a movie together (Shirley MacLaine also appears in the latter film). In December 1987, at Chasen's restaurant in Los Angeles, Sinatra, Davis, and Martin announced a 29-date tour, called Together Again, sponsored by HBO and American Express. At the press conference to announce the tour, Martin joked about calling the tour off, and Sinatra rebuked a reporter for using the term "Rat Pack", referring to it as "that stupid phrase". Dean Martin's son, Dean Paul Martin, had died in a plane crash in March 1987 on the San Gorgonio Mountain in California, the same mountain where Sinatra's mother, Dolly, had been killed in a plane crash ten years earlier. Martin had since become increasingly dependent on alcohol and prescription drugs. Davis had hip replacement surgery two years previously, and been estranged from Sinatra because of Davis' use of cocaine. Davis was also experiencing severe financial difficulties, and was promised by Sinatra's people that he could earn between six and eight million dollars from the tour. Martin had not made a film or recorded since 1984, and Sinatra felt that the tour would be good for Martin, telling Davis, "I think it would be great for Dean. Get him out. For that alone it would be worth doing". Sinatra and Davis still performed regularly, yet had not recorded for several years. Both Sinatra and Martin had made their last film appearances together in 1984's Cannonball Run II, a film which also starred Davis. This marked the trio's first feature film appearance since 1964's Robin and the 7 Hoods. Martin expressed reservations about the tour, wondering whether they could draw as many people as they had in the past. After private rehearsals, at one of which Sinatra and Davis had complained about the lack of black musicians in the orchestra, the tour began at the Oakland-Alameda County Coliseum Arena on March 13, 1988. To a sold-out crowd of 14,500, Davis opened the show, followed by Martin and then Sinatra; after an interval, the three performed a medley of songs. During the show, Martin threw a lit cigarette at the audience. Martin withdrew from the tour after just five shows, with the official reason stated as being a flare-up of a kidney problem. Sinatra and Davis continued the tour under the title "The Ultimate Event" with Liza Minnelli replacing Martin as the third member of the trio. Davis's associate stated that Sinatra's people were skimming the top of the revenues from the concerts, as well as stuffing envelopes full of cash into suitcases after the performances. In August 1989, after Davis experienced throat pain, he was diagnosed with throat cancer which caused his death in May 1990. Davis was buried with a gold watch that Sinatra had given him at the conclusion of The Ultimate Event Tour. A 1989 performance of The Ultimate Event in Detroit was recorded and shown on Showtime the following year as a tribute to the recently deceased Davis. A review in The New York Times praised Davis's performance, describing him as "pure, ebullient, unapologetic show business." Concerning the group's reputation for womanizing and heavy drinking, Joey Bishop stated in a 1998 interview: "I never saw Frank, Dean, Sammy or Peter drunk during performances. That was only a gag! And do you believe these guys had to chase broads? They had to chase 'em away!" Archival footage of Lawford and Sinatra were used in the 1974 compilation film That's Entertainment!. Shirley MacLaine appeared in the 1958 film Some Came Running along with Sinatra and Martin. She had a major role (and Sinatra a cameo) in the 1956 Oscar-winning film Around the World in 80 Days. MacLaine played a Hindu princess who is rescued by, and falls in love with, original Rat Pack associate David Niven, and Sinatra had a non-speaking, non-singing role as a piano player in a saloon, whose identity is concealed from the viewer until he turns his face toward the camera during a scene featuring Marlene Dietrich and George Raft. MacLaine appeared alongside Sinatra in the 1960 film Can-Can. She also had an appearance in the 1960 film Ocean's 11 as a drunken woman. The 1984 film Cannonball Run II, with MacLaine, marked the final time members of the Rat Pack shared theatrical screen-time together. A biopic, The Rat Pack, made by HBO in 1998, starred Ray Liotta as Sinatra, Joe Mantegna as Martin and Don Cheadle as Davis, dramatizing their private lives and, in particular, their roles in the 1960 presidential campaign of John F. Kennedy. Christmas with the Rat Pack, a collection of holiday tunes sung by Sinatra, Martin and Davis, was released in 2001. The Ultimate Rat Pack Collection: Live & Swingin' went on sale in 2003. A concert featuring the three men, Live from the Sands in Las Vegas, also is available on CD. ↑ michel, peter. "UNLV Libraries, The Rat Pack, retrieved May 2, 2007". Library.unlv.edu. Retrieved 2012-01-10. ↑ "Sergeants 3 (1962)". The Movie Portal. 1962-02-10. Retrieved 2012-01-10. ↑ "Rat Pack (Frank Sinatra: Dean Martin: Sammy Davis Jr): Big Three: 3cd (2008): CD". hmv.com. Retrieved 2012-01-10. ↑ "The Rat Pack Captured". Tvclassics.com. 1965-06-20. Retrieved 2012-01-10. ↑ Takiff, Jonathan (1988-09-27). "Frank, Liza & Sammy The Ultimate Event!". Philadelphia Daily News. Retrieved 2016-05-01. ↑ "With Sammy Davis, the Spirit Lingers". The New York Times. March 6, 1989. Retrieved 2009-06-05. Gehman, Richard (1961). Sinatra and His Rat Pack. Belmont. Levy, S. (1998). Rat Pack Confidential. London: Fourth Estate. ISBN 1-84115-001-0. Spada, James (1991). Peter Lawford: The Man Who Kept the Secrets. New York: Bantam Books. ISBN 0-553-07185-8. "Rat Pack in Palm Springs (series)". The Desert Sun. Palm Springs, California: Gannett.